This listing is for a NINE day Road Opener, also known as an "Abre Camino" service. 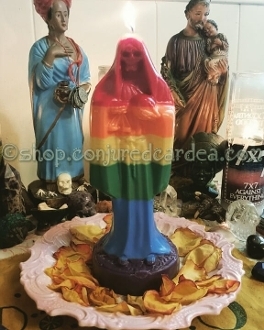 This service utilizes a 7 color, Santa Muerte candle designed to reveal your positive, living paths before you in order to bypass negative choices and dead opportunities. ***PLEASE ALLOW UP TO 14 DAYS FOR THE FULL PROCESS AND REPORT OF THE WORKING. THIS ENSURES THERE IS ADEQUATE TIME FOR COMPLETION AND DISPOSAL OF THE WORKING.